Cardi B and Kylie Jenner named as the worst dressed celebrities at the Grammys 2019. Do you agree? The 61st Grammys ceremony kicked off last night with the biggest artists in the music industry from last year attending the event and respectively taking home some of the prestigious awards they won. And it's no secret that most of the Hollywood celebrities manifest their creativity not just through music but through fashion as well. And the 2019 Grammy Awards held last night can be referenced as one. In case, you missed the interesting dresses (from fanciful dresses to some weird looking dresses) these celebrities wore at the show last night, scroll below to see them here. This red fluffy gown Pop star Bebe Rexha, who also scored the 'Best New Artist' nomination wore for her Grammy night definitely gave her a Cinderella moment she wished for. The dramatic layered crimson tulle dress Rexha opted to wear comes from Monsoori after certain fashion designers refused to dress her because she is a size 6/7. One can surely make fun of Heidi Klum for her dress representing football shoulder pads, but we love how her White and sparkly mini dress by Stephane Rolland from her Spring 2018 Couture gives us an angelic vibe. The 'America's Got Talent' judge wore Lorraine Schwartz jewelry to accessorize her outfit. First of all Congratulation to Lady Gaga on winning her three Grammys last night. The sequin silver Celine dress designed by Hedi Slimane and the 100 carats of Tiffany & Co. diamonds on her neck truly makes us believe that 'A Star is Born' indeed. The 34 years old singer Katy Perry rocked a pink gown that sparked a Barbie vibe. Perry rocked the pink and silver Balmain dress that gave her a bold yet a sweet look. Congrats Dua Lipa for winning not only one but two Awards last night. 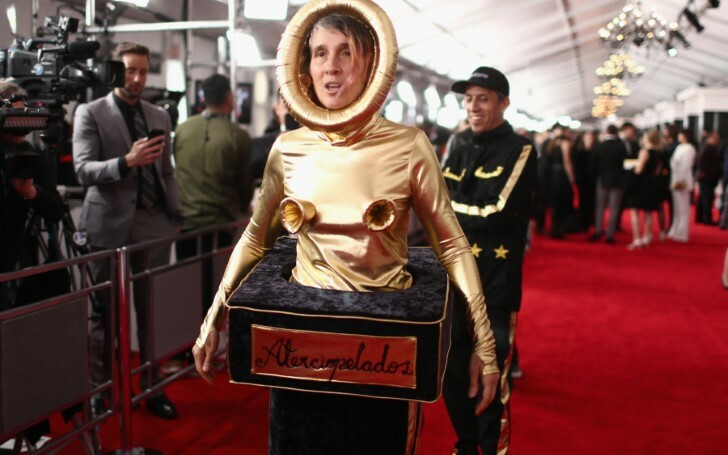 We don't think anyone stunned the Grammys night as much as the 'Best New Artist' Award recipient did. The singer walked the red carpet in a body-hugging silver gown that featured a sweetheart neckline and a draped bodice and Bvlgari jewels. However, not all the stars arrived with a pleasant look. Check out the list of the worst dressed celebrities. Probably the most disappointing outfit Kylie Jenner wore so far in any event. The pastel pink dress is cute and all, but Kylie could have done better with her Grammy debut. Sorry, Kylie, we ain't feeling your pink jumpsuit. Rapper Cardi B among one of the winners last night stepped into the red carpet looking like a human version of an oyster or more like Ursula from 'The Little Mermaid' in the pink vintage couture dress. 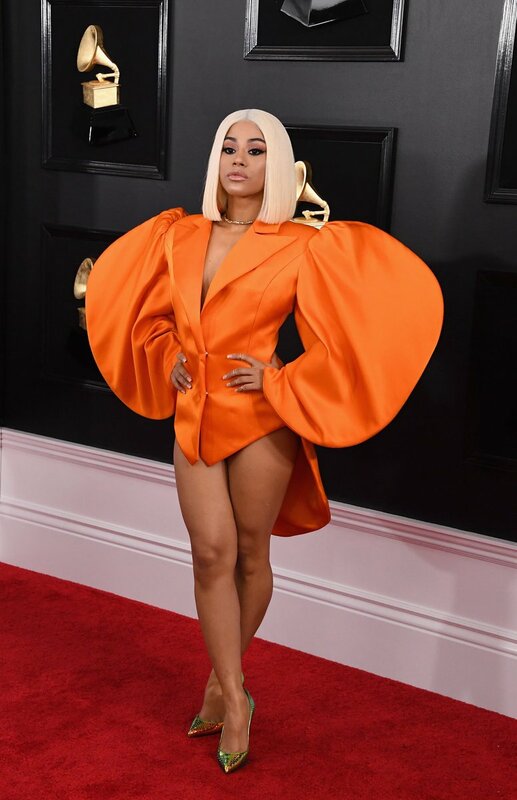 The young sister of Cardi B and TV personality Hennessy Carolina arrived at the Grammys carpet to support her sissy by presenting herself in a mini pantless dress. The bold and dramatical orange blazer-style dress featured puffy sleeves that made Hennessy look like a butterfly. We loved the tribute performance by Andra Day to honor the Queen of Soul, Aretha Franklin. But, with a tutu resembling dress? It appears that her stylist tricked her into thinking the singer needed to leave for a ballet class instead of the Grammys. Well, not the first time Joy Villa presented herself in a Trump supporting dress. Like we get the point of her dress, but we believe the singer could have hired a better designer for her 'Build The Wall' pro-Trump gown that could have avoided the hurtful looking barbed wire attached on her shoulder.